Just to clarify, this GT430 Sport is just as quick as the GT430, which was the fastest road-going Lotus ever, but now the Sport has a higher top speed of 196 mph, making it the new fastest road-going Lotus ever. These are faster than the Lotus 3-Eleven, which was purpose built a few years ago to be the fastest road-going Lotus ever, but is not anymore. Anyway, the GT430 Sport still has 430 horsepower from that 3.5-liter supercharged Toyota V6, with a claimed 0-60 time of 3.7 seconds. It’s also now less expensive than the GT430. Lotus changed some of the bodywork to be less intense, and that means some of the downforce has been lost in the process. They took away downforce... on a car they made faster... to save 10 kg of weight and make it look prettier. It also means that it’s potentially slower on anything but a straight road. So is it actually the fastest road-going Lotus? Also new is that it will now come with an option for an automatic transmission, which Lotus claims will get a little boost in torque but lose about a tenth of a second in the 0-60 time. What an odd car. 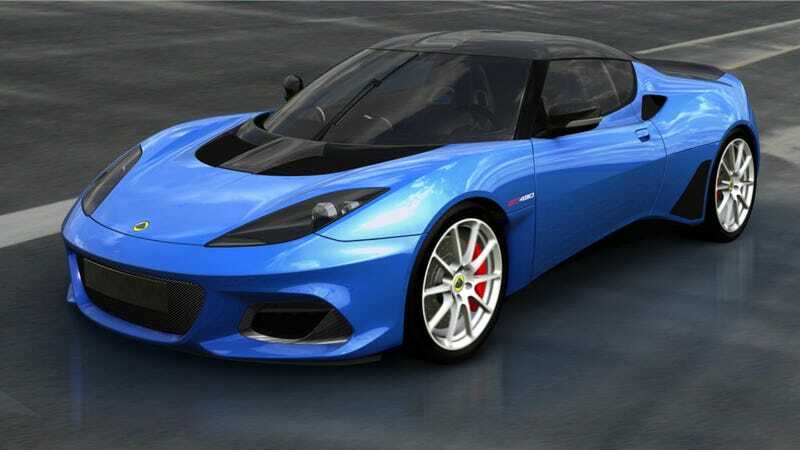 Why would you want to ever buy the fastest Lotus ever if you knew it had a shelf life of maybe 12 months maximum? Maybe they’ll be able to build a crazy supercar under their new ownership and finally settle it.